It is a little intimidating for me to think about presenting any kind of a mystery story with all of the accomplished mystery and story writers represented within our book club. However, the story that I’ll share this month is a bit of a mystery that we experienced late last year. And as you’ll see hopefully, it ties in nicely with the theme for this month’s magazine. So if you’re ready, pour yourself a nice hot cup of coffee and settle in for a few minutes while I share with you the mystery of the blue cross. On a cold and clear December night last year we were driving home from our Sunday school class Christmas dinner with a couple who are good friends of ours who graciously opened up their home to us for the month of December. On our way Debbie noticed a blue light in the sky off in the distance and pointed it out to the rest of us. It took the rest of us a few moments to see it because of the trees and the distance. But once we saw it we knew it was something different. We decided to try to get closer to it to see what it was. Once we finally got a little closer to it we could tell it was a cross. But where was it coming from? Who put it up there? How did they put it up there? We made our way around the curves, hills, and subdivisions of northwest Georgia and finally pulled into a subdivision where we could get a pretty good look at it. Sure enough it was a blue cross. But we were still no closer to the who or the how. 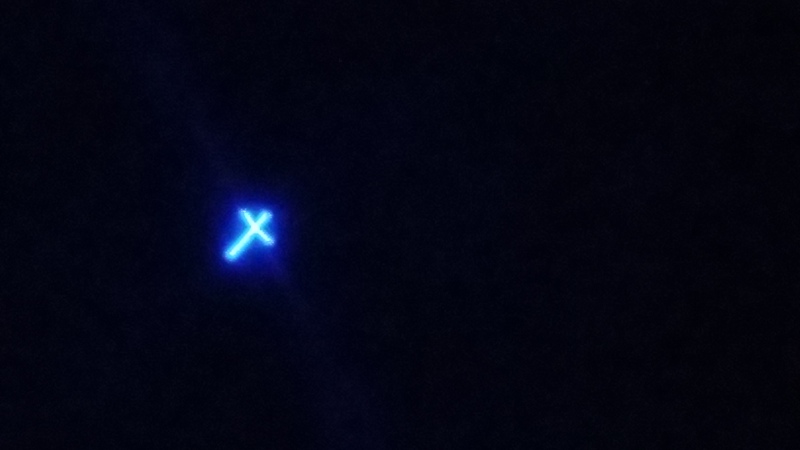 We thought that maybe one of the churches was somehow broadcasting the image of the cross using lights or lasers of some sort. So we drove around the area looking at the local churches to see if we could find out which one of them was responsible for the blue cross. There was a church that had their Christmas concert earlier that evening so we thought maybe it was a part of their celebration. But as we neared the church it became apparent that the cross was not emanating from there. We had to get home because it was getting a little late so we abandoned the search. As it turned out the cross was visible from our friend’s house although from that distance it wasn’t apparent that it was a cross. However, we knew better. As the days went by leading up to Christmas we noticed that the cross was not visible every night so that became yet another point of curiosity. Why would the cross only be visible at certain times and not others? There seemed to be no pattern we could discern. One night Jean and I were coming back to our friend’s house by ourselves and we could see the cross in the sky. So we decided to take up the search again. We pulled into the first subdivision we went to during the first search where we could get a pretty good look at it. Jean noticed that in the very gentle breeze that night that the cross was moving ever so slightly. It was almost impossible for me to detect at first. But then I saw it move too. The cross was waving as if on some kind of a sheet or piece of fabric. We still didn’t know how it got up there or how it was lit up but we continued the search. At this point we abandoned the idea that it was being broadcast somehow from one of the churches so we focused on the nearby subdivisions. As we entered a neighborhood a little closer we could see that there was some kind of a tether leading up to the cross. And in the reflection I could occasionally see something that resembled a balloon a few feet above the cross. Now we were getting somewhere. The cross was tethered to something and thereby appeared to be floating in sky. We assumed that the cross was lit up using LED bulbs, probably battery or solar powered, although I suppose an electrical cord could be part of the equation since the cross was tethered to the ground somehow. We continued to advance down the road turning into each subdivision we found that got us closer to the cross. I don’t remember exactly but it may have been the fourth or fifth subdivision we turned into but we were really close. This was a large subdivision that we’d never been in before and as we made more and more turns trying to get closer to the cross it was becoming clear that we might have a hard time finding our way out again. Obviously GPS would come to the rescue if necessary so it wasn’t any kind of serious concern. Finally we were in a cul de sac very close to the cross. We knew that we might only be a few streets or a subdivision or two away but we didn’t know for sure where we would find it but we were close. We thought that when we got there we might find a house with a display announcing that they were flying the cross. Maybe they’d have some sort of message playing or there would be some literature available. We had no idea what we might find. Sure, we could have tried to continue on without the cross in sight but that would prove more challenging even though we knew we were close. And at this point it was starting to get late and we didn’t want to be disrespectful to our friends so we started making our way home. By the time we were back on the main road and about half way home the cross appeared again. We only saw it once or twice more after that but we never got to the source of the cross. We did learn that the cross had been displayed before Christmas like this for about 7 years but we still don’t know who is behind it. So in that respect, the mystery is not solved. Likewise, the cross of Calvary is a mystery to many today. We met a young woman while on our search for the blue cross who was out walking her dog. She is the one who told us that the cross had been visible there for the 7 years she lived in that neighborhood. As we were finishing up the conversation she even said that she thought it was “creepy”. Looking back on it that should have been an open door to share with her the truth of the cross. I am ashamed that I didn’t know what to say in that moment because I was so stunned at her response. For those who haven’t sought after the Lord I guess the cross could be considered creepy. Maybe some of the weirdness done in the name of Jesus and religion makes the cross, and the whole notion of Christianity, seem creepy. For certain our enemy, satan (purposely not capitalized), does everything in his limited power to make the cross seem scary, creepy, offensive, disgusting, or whatever, to steer people away from the truth of the cross. Paraphrasing Jeremiah 29:13, God told the prophet Jeremiah that if he searched for God with all of his heart that He would be found. The God of the universe desires to be found. Along with seeking is the concept of drawing near and that is exactly what God desires. He desires to be near to us. But we are easily distracted. He created us, He knew we would be easily distracted, but He had a plan from the beginning. And that plan was the cross. The old rugged cross that Jesus was nailed to for our sin. In the hands of men the cross is not pretty-it is an instrument of death, and therefore creepy I suppose. But in the hands of God, the cross is transformed into something beautiful. We have to draw near to the cross, pick up our cross and carry it as Jesus instructed, if we want to be His disciple. That is my prayer for you, and for the young woman we met that cold night in December on our search for the blue cross, that you draw near to God, but that you do it His way, by drawing near to Jesus and the cross, for that is the only way God has provided.